By Joseph Conrad; Wordsworth; Editions Limited; @1995; first published before television in 1899; 74 pages. At 74 pages, this may be the longest book I’ve ever read in my life. Whereas the story of the Heart of Darkness has some interest in it, the telling is excruciating. I’ve heard about this story for as long as I can remember, so I was convinced there must be something to it. You would think it would be interesting what with the setting in the Congo and the ivory, the mysterious Kurtz, and cannibals on-board a tin can of a boat going down a river. And the fog. I love fog! But the terrors do not come in the suspense of the story, but in the awful drudgery of wading through it, rather like wading through a muddy river bottom after a soaking rain and having to struggle for each step forward until the muddy bog finally releases your rubber boots with an awful sucking noise—thwup! Save yourself; find the movie and watch it. Word Wabbit…thwupping Conrad. Yeah, it’s not the fear in the book…it’s more the sopping wet drudgery of colonialism. The best part of that book is when the ship is sitting offshore, firing cannon balls into a continent. I’ve read this five or six times, always for the language, usually forgetting what I read ten or fifteen minutes before. I like the book, but I agree, it’s kind of a slog. I think the story has so much potential. I think I read it with expectations that were too high. Oh dear… I too have been reading ‘Heart of Darkness’ and thought it was my lack of concentration and determination which was making it hard work. Like you it sounded so appealing to me, so dark and mysterious… and weird! I might plod on a bit further… but I am struggling!! Yep, I was hoping I could blame a translator. I’ve been reading a book called The First 50 Pages by Jeff Gerke, and based on his guidelines for novelists, I don’t think The Heart of Darkness would be published today. I don’t debate that it’s an important topic. It’s certainly very important. Then I thought, well, it was written so long ago. But that’s no excuse either. Look at Tolstoy or Edith Wharton, and that list could go on and on. At the risk of sacred cow tipping, I think this book was a “flavor of the day” book that no one can now admit had a great topic but poor writing and character development. The ending, if you get there, was quite offensive to women. We’re back to the propaganda and ignorance of women as the lesser. 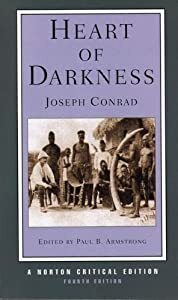 I know that I have entered sacred cow territory with my unfavorable review of Heart of Darkness, but I refuse to like a book just because people say I am supposed to like it. I have read widely enough and have studied literature long enough to form my own critical opinions. On a personal level, I am glad that Joseph Conrad was able to “make good.” But on an honest literary level, someone is going to have to present an argument—with evidence—to get me to see that this work has solid artistic value. The writing is dull. The character development is dull. And, the depiction of women is horrendous. I searched for reasons to attribute this to such as time period and culture. But these excuses fall short given that quality literature was produced during this time. I knew that English was not Conrad’s first language,but since I was forced to read this creation in the language in which it was written, English, I am judging it based on the final output that was given to the world. In summary, a link that states that I should love this work because everyone else does is not going to work with me. Only an argument with the merits of this work clearly identified will have any effect on my opinion. If there is one thing that literature hopefully does for us, it is to get us to form our own opinions and to exercise that often weakened muscle that prevents us from acting like sheep.